This is a great holiday or Christmas themed activity that can be enjoyed by the entire family or office staff for fun or competition. 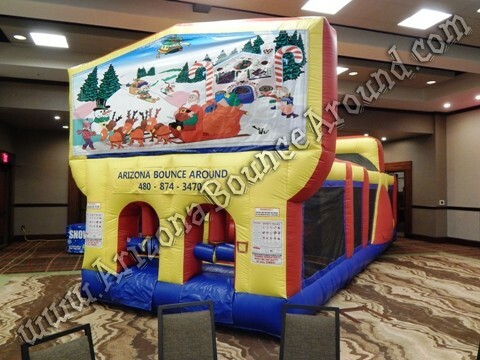 This 30 foot long inflatable obstacle course not only has the holiday look but is packed with obstacles, popups, squeze panels and a 2 lane slide inside to the finish making this a great holiday activity for all age groups. Squeze tubes ahead!! Netting all the way around makes it secure for players racing thru this 30 foot long obstacle course and for people outside to see in as people race thru to the finish. The duel lane slides at the end feature a foam landing pad on the ground.